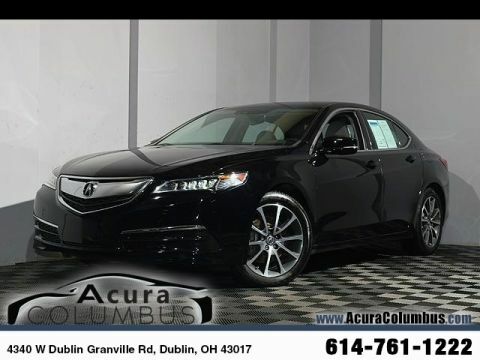 2015 Acura TLX 3.5L V6 SH-AWD w/Technology Package Black 21/31 City/Highway MPG Odometer is 11296 miles below market average! 21/31 City/Highway MPG Reviews: * The TLX is the definition of smart luxury if you value the driving experience and appreciate Acura's cutting edge technologies like 4-wheel steering or Super Handling All-Wheel Drive over the prestige bestowed by having a European badge on your car's nose. Source: KBB.com * Quiet interior; good fuel economy ratings; sporty handling, particularly with all-wheel drive; plenty of features for the money. Source: Edmunds * Introducing the all new 2015 Acura TLX. The TLX has been shaped and trimmed to reduce drag, lift, turbulence, and rolling resistance. Weight has been reduced by using lighter tougher metals such as aluminum and ultra high strength steel. The 8-Speed 2.4L engine with 206hp with 182 lb-ft of torque has a Dual Clutch Transmission making upshifts and downshifts swift and seamless. Also available is a 9-Speed 3.5L V6 with 290hp and 267 lb-ft of torque featuring Variable Cylinder Management which lets the engine transition to three cylinders at cruising speeds enhancing fuel efficiency. Standard Precision All-Wheel Steer delivers unprecedented handling and is the first system that enables the rear wheels to adjust toe angles independently. Super Handling All-Wheel Drive is also available to direct engine power to match weight distribution. 10 stunning Jewel Eye LED headlights appear like gems in a jeweler's case and light up the night. The beauty continues inside with lit analog gauges and the On Demand Multi-Use Display touchscreen which controls audio and climate functions. The Audio System with a 15GB HDD media storage and 7 speakers allows functionality with multiple sources including USB, CD, Sirius XM, and Pandora. Also available is a 10 speaker premium system by ELS Studio. The Acura Navigation System uses hard drive data for ultra-fast response on the 8-inch screen and can display menus, maps and directions along with additional features such as Zagat restaurant reviews and real-time traffic. Acoustic noise-dampening foam introduced into the unibody provides vault-like silence. Available safety features include lane keeping assist, adaptive cruise control, blind spot warnings, and parking sensors. Source: The Manufacturer Summary Awards: * 2015 IIHS Top Safety Pick+ * 2015 KBB.com Our 10 Favorite New-for-2015 Cars * 2015 KBB.com 10 Best Luxury Cars Under $35,000 For more information, visit www.kbb.com. Kelley Blue Book is a registered trademark of Kelley Blue Book Co., Inc. *Insurance Institute for Highway Safety. KBB Fair Market Range Low: $20,997 KBB Fair Market Range High: $24,508 Celebrating 30 Years as Ohio's First Acura Dealer! 614-761-1222 Proudly Serving: Dublin, Columbus, Westerville, Chillicothe, Dayton, Xenia, Springfield, Wilmington, Beavercreek, Marysville, Cincinnati, Cleveland, Lancaster, West Jefferson, Grove City, and all of greater Ohio. 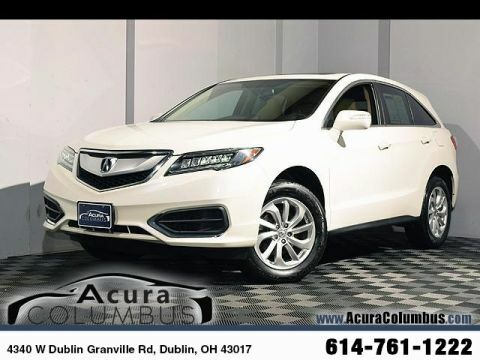 2016 Acura RDX AWD w/Technology Package White 19/28 City/Highway MPG New Tires, AWD. 19/28 City/Highway MPG Reviews: * Strong acceleration and fuel economy from standard V6 engine; high-mounted rear seat provides generous legroom and a commanding view; more standard features than most competitors; price; generous cargo capacity for the segment. Source: Edmunds Awards: * 2016 KBB.com 10 Best Luxury Cars Under $35,000 * 2016 KBB.com 5-Year Cost to Own Awards 2016 Kelley Blue Book Brand Image Awards are based on the Brand Watch(tm) study from Kelley Blue Book Market Intelligence. Award calculated among non-luxury shoppers. For more information, visit www.kbb.com. Kelley Blue Book is a registered trademark of Kelley Blue Book Co., Inc. KBB Fair Market Range Low: $23,848 KBB Fair Market Range High: $26,451 Celebrating 30 Years as Ohio's First Acura Dealer! 614-761-1222 Proudly Serving: Dublin, Columbus, Westerville, Chillicothe, Dayton, Xenia, Springfield, Wilmington, Beavercreek, Marysville, Cincinnati, Cleveland, Lancaster, West Jefferson, Grove City, and all of greater Ohio. 2016 Acura RLX Advance Package Black 20/31 City/Highway MPG Certified. Acura Certified Pre-Owned Details: * Vehicle History * Transferable Warranty * Includes Trip Interruption and Concierge Services * Roadside Assistance * Powertrain Limited Warranty: 84 Month/100,000 Mile (whichever comes first) from original in-service date * 182 Point Inspection * Warranty Deductible: $0 * Limited Warranty: 12 Month/12,000 Mile (whichever comes first) after new car warranty expires or from certified purchase date ** Acura CERTIFIED **, Passed Acura Certified Inspection. Odometer is 13726 miles below market average! 20/31 City/Highway MPG Reviews: * Spacious seating with room for adults to stretch out in back; plentiful standard features, including some that are typically options; quick acceleration from Sport Hybrid model; excellent crash-test scores. Source: Edmunds Awards: * 2016 KBB.com 5-Year Cost to Own Awards 2016 Kelley Blue Book Brand Image Awards are based on the Brand Watch(tm) study from Kelley Blue Book Market Intelligence. Award calculated among non-luxury shoppers. For more information, visit www.kbb.com. Kelley Blue Book is a registered trademark of Kelley Blue Book Co., Inc. KBB Fair Market Range Low: $28,080 KBB Fair Market Range High: $31,467 Celebrating 30 Years as Ohio's First Acura Dealer! 614-761-1222 Proudly Serving: Dublin, Columbus, Westerville, Chillicothe, Dayton, Xenia, Springfield, Wilmington, Beavercreek, Marysville, Cincinnati, Cleveland, Lancaster, West Jefferson, Grove City, and all of greater Ohio. 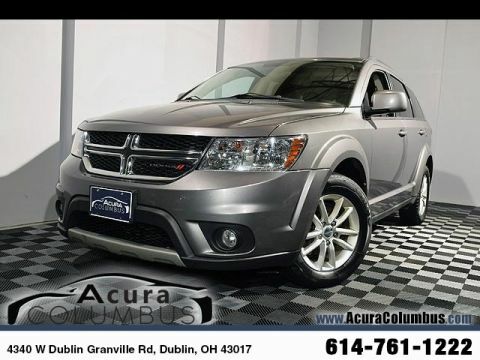 2013 Dodge Journey SXT Storm Gray 19/26 City/Highway MPG 19/26 City/Highway MPG Reviews: * If your growing family demands a vehicle with minivan-like proportions, but you don't want a minivan, check out the 2013 Dodge Journey. 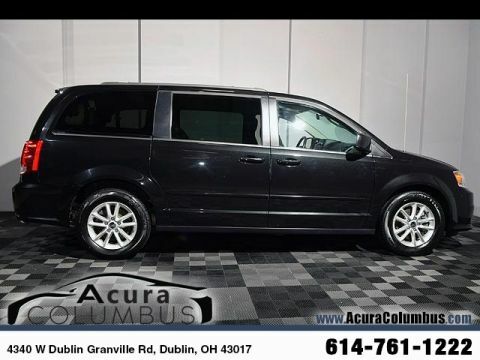 With its available V6, 7-passenger seating and AWD, the Journey can handle most of what fits into a traditional minivan and still maintain its less-bland SUV-like appeal. Source: KBB.com * Sophisticated interior; family-friendly size; available built-in booster seats; strong V6; smart touchscreen interface. 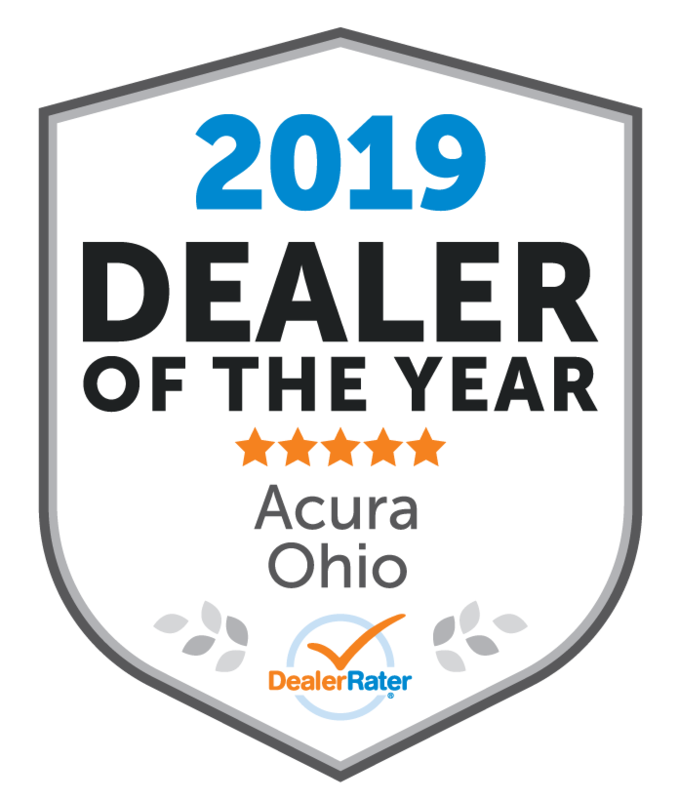 Source: Edmunds Awards: * Ward's 10 Best Engines KBB Fair Market Range Low: $7,663 KBB Fair Market Range High: $9,396 Celebrating 30 Years as Ohio's First Acura Dealer! 614-761-1222 Proudly Serving: Dublin, Columbus, Westerville, Chillicothe, Dayton, Xenia, Springfield, Wilmington, Beavercreek, Marysville, Cincinnati, Cleveland, Lancaster, West Jefferson, Grove City, and all of greater Ohio. 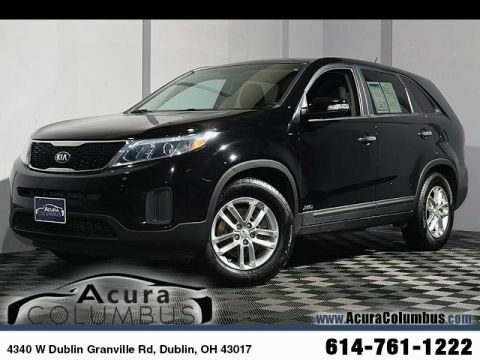 2015 Kia Sorento LX Ebony Black 19/25 City/Highway MPG AWD. Reviews: * If you're looking for a 7-passenger crossover SUV big on comfort, safety, style and in-cabin technology, the 2015 Kia Sorento ranks among the best in class. Source: KBB.com * Plentiful standard and optional features; quiet and comfortable ride; superior tech interface; powerful V6; available third-row seat; lengthy warranty. Source: Edmunds * The 2015 Kia Sorento is a world-class crossover that provides an outstanding combination of design and performance. The Sorento's 191-hp 2.4L Gasoline Direct Injection 4-cylinder engine and available 290-hp 3.3L GDI V6 engine both deliver outstanding performance. A 6-speed automatic transmission operates with smooth, seamless efficiency and its Sportmatic design allows you to choose between automatic shifting and, for a sportier experience, clutch-free manual shifting. The Sorento provides an exceptionally smooth and quiet ride along with precise handling, thanks to its unibody design and all-new suspension system. The Sorento's spacious cargo area provides exceptional versatility. Its 40/20/40 split-folding second-row seats and available 50/50 split-folding third-row seats let you carry up to 7 passengers, cargo, or both. Interior features available include ventilated driver and front passenger seats that circulate cool air through the seat leather, heated front seats and second-row seat outboard cushions, panoramic sunroof and power sunshade, and second row sunshades. The Sorento's fine craftsmanship and luxury features let you travel in style and comfort. Available features include a heated steering wheel, a voice-command navigation system with rear-camera display, blind-spot detection, push-button start, and the innovative UVO infotainment system which lets you use your compatible cell phone to make hands-free calls, receive and respond to text messages, listen to streaming audio, and play your favorite song, artist or genre of music all by giving a single voice command. An advanced airbag system helps to protect the driver and passengers with front, side and side curtain airbags. The front seats feature active headrests and seat-belt pretensioners. Sorento wraps you in a protective, high strength steel reinforced body that helps minimize damage, absorb impact energy and protect you in case of collision. Source: The Manufacturer Summary Awards: * JD Power Initial Quality Study (IQS) * 2015 KBB.com 10 Best SUVs Under $25,000 KBB Fair Market Range Low: $13,741 KBB Fair Market Range High: $15,796 Celebrating 30 Years as Ohio's First Acura Dealer! 614-761-1222 Proudly Serving: Dublin, Columbus, Westerville, Chillicothe, Dayton, Xenia, Springfield, Wilmington, Beavercreek, Marysville, Cincinnati, Cleveland, Lancaster, West Jefferson, Grove City, and all of greater Ohio. 2016 Dodge Grand Caravan SXT Brilliant Black Crystal Pearlcoat 17/25 City/Highway MPG Odometer is 17307 miles below market average! KBB Fair Market Range Low: $14,288 KBB Fair Market Range High: $18,479 Celebrating 30 Years as Ohio's First Acura Dealer! 614-761-1222 Proudly Serving: Dublin, Columbus, Westerville, Chillicothe, Dayton, Xenia, Springfield, Wilmington, Beavercreek, Marysville, Cincinnati, Cleveland, Lancaster, West Jefferson, Grove City, and all of greater Ohio. 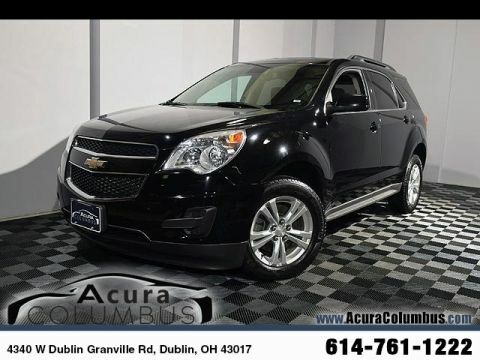 2015 Chevrolet Equinox LT 1LT Black 20/29 City/Highway MPG AWD. Odometer is 12693 miles below market average! 20/29 City/Highway MPG Reviews: * If you haul rear-seat passengers more often than you fill the cargo area in your compact SUV, then you might want to give the 2015 Chevy Equinox a look. The ability to tow 3,500 pounds in V6 models is shoulders above most competitors. Source: KBB.com * Premium look inside and out; strong optional V6 engine; quiet interior; comfortable highway ride; spacious and adjustable backseat. Source: Edmunds * The 2015 Equinox is Chevrolet's stylish and efficient sizzling compact crossover. The Equinox stretches the boundaries of the term compact as it is noticeably larger than its rivals. That size difference affords more room for passengers in the second row seat and a larger presence on the road. The 2015 Chevy Equinox is a comfortable and quiet ride and drives like a more expensive car. It has an edge in passenger comfort, especially in the rear, where the bench seat can move several inches fore and aft to create more legroom. Up front, driver and passenger benefit from generous-sized seats. The 2015 Equinox has a blend of soft curves at its edges to balance the vehicle's rectangular shape. A long hood further helps even out the Chevy's proportions. It all works to give the Equinox an athletic appearance. Other standout aesthetics include the signature 2-bar grille, floating fog light bezels and creased fender flares. The Equinox comes standard with a fuel-efficient 4-cylinder engine that makes an adequate 182 horsepower. You may also choose the impressive V6 that puts out 301 horsepower. Both engines are connected to a 6-speed automatic transmission. Front-wheel drive (FWD) is standard with all-wheel-drive as an option for both engines. The 4-cylinder model can tow a maximum of 1,500 pounds while the V6 can pull 3,500 pounds. If you want a small-do-it-all SUV with plenty of passenger space, a comfortable ride and good fuel economy, consider the Chevy Equinox. Source: The Manufacturer Summary Awards: * JD Power Initial Quality Study * 2015 IIHS Top Safety Pick KBB Fair Market Range Low: $16,015 KBB Fair Market Range High: $18,078 Celebrating 30 Years as Ohio's First Acura Dealer! 614-761-1222 Proudly Serving: Dublin, Columbus, Westerville, Chillicothe, Dayton, Xenia, Springfield, Wilmington, Beavercreek, Marysville, Cincinnati, Cleveland, Lancaster, West Jefferson, Grove City, and all of greater Ohio. 2013 Honda CR-V EX-L Basque Red Pearl II 22/30 City/Highway MPG AWD. Odometer is 45757 miles below market average! 22/30 City/Highway MPG Reviews: * Lots of room for passengers and cargo; high fuel economy; user-friendly controls; ample tech and family-friendly features; top crash test scores. 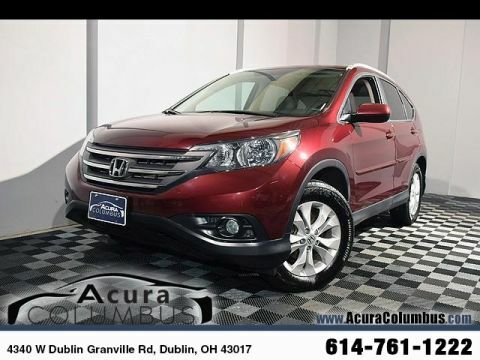 Source: Edmunds * If you're looking for simple, dependable transportation in a vehicle that can handle snow and mud as efficiently as it does a day of cruising yard sales, the 2013 Honda CR-V is an excellent choice. Need more reasons? There's good fuel economy, a reasonable price and lots of standard equipment. Source: KBB.com Awards: * 2013 KBB.com Brand Image Awards 2016 Kelley Blue Book Brand Image Awards are based on the Brand Watch(tm) study from Kelley Blue Book Market Intelligence. Award calculated among non-luxury shoppers. For more information, visit www.kbb.com. Kelley Blue Book is a registered trademark of Kelley Blue Book Co., Inc. KBB Fair Market Range Low: $17,407 KBB Fair Market Range High: $20,518 Celebrating 30 Years as Ohio's First Acura Dealer! 614-761-1222 Proudly Serving: Dublin, Columbus, Westerville, Chillicothe, Dayton, Xenia, Springfield, Wilmington, Beavercreek, Marysville, Cincinnati, Cleveland, Lancaster, West Jefferson, Grove City, and all of greater Ohio. 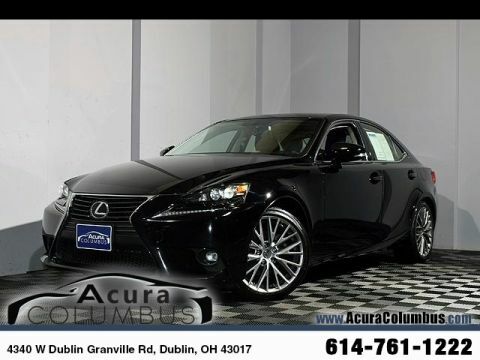 2015 Lexus IS 250 Gray 20/27 City/Highway MPG AWD, Black w/NuLuxe Seat Trim or Leather Seat Trim w/Contrast Stitching or F Sport Nuluxe Seat Trim. 20/27 City/Highway MPG Reviews: * Upscale interior design with premium materials; excellent steering; smooth ride (except F Sport); edgy styling. Source: Edmunds * The Lexus IS line showcases a bold and captivating design, with additional interior room, and better handling than before. In front there is an incredibly stylish yet aggressive spindle grille and angled headlights. The rest of the body is exquisitely shaped, with dramatic, aerodynamic lines. Plus, with its wider stance, stretched wheelbase, and underbody panels to further reduce wind resistance, this car was designed to move. Lexus gives you a wide range of model variations to pick from. There is the 204hp IS 250 and IS 250 F Sport, as well as the 306hp IS 350 and IS 350 F Sport. Each can be purchased with Rear-Wheel Drive or All-Wheel Drive. The IS 250 models come with a 2.5L V6, that gets up to 21 MPG City and 30 MPG hwy. The IS 350 Models come with a 3.5L V6 that gets up to 19 MPG City and 28 MPG hwy. The IS interior is incredible. It has low sport seating in front, and close to 3 extra inches of legroom in back. The highly comfortable NuLuxe faux-leather seats are not to be missed, and extra headroom in front and back will keep you from feeling constrained. Plus, if you purchase any of the F Sport models, prepare to be amazed by the advanced digital instrument cluster. Lexus has given the IS line a generous array of standard features. Some items include a power moonroof, push-button start, drive mode select and an 8-speaker Sound System that comes with a 7-inch color screen. Some standard safety features you get are 10 airbags, anti-lock brakes, brake assist, and traction control. As an option, some incredible safety technology available includes the Pre-Collision System with Dynamic Radar Cruise Control, Intuitive Parking Assist, and Blind Spot Monitor with Rear Cross-Traffic Alert. Source: The Manufacturer Summary * If you're looking for an entry-level luxury sedan, but want something with dynamically out-there styling to back up its driving characteristics, you can't do better than the 2015 Lexus IS sedan. Yeah, we just said a Lexus is the most visually striking sedan in its class. How times change. 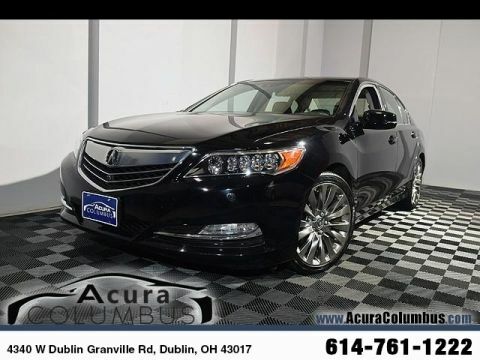 Source: KBB.com Awards: * 2015 KBB.com Best Resale Value Awards KBB Fair Market Range Low: $21,293 KBB Fair Market Range High: $24,760 Celebrating 30 Years as Ohio's First Acura Dealer! 614-761-1222 Proudly Serving: Dublin, Columbus, Westerville, Chillicothe, Dayton, Xenia, Springfield, Wilmington, Beavercreek, Marysville, Cincinnati, Cleveland, Lancaster, West Jefferson, Grove City, and all of greater Ohio. 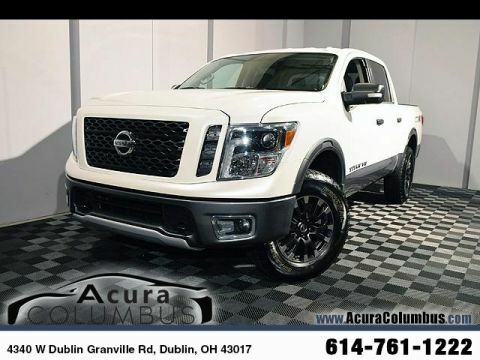 2018 Nissan Titan PRO Pearl White 15/20 City/Highway MPG 4WD. KBB Fair Market Range Low: $34,513 KBB Fair Market Range High: $38,882 Celebrating 30 Years as Ohio's First Acura Dealer! 614-761-1222 Proudly Serving: Dublin, Columbus, Westerville, Chillicothe, Dayton, Xenia, Springfield, Wilmington, Beavercreek, Marysville, Cincinnati, Cleveland, Lancaster, West Jefferson, Grove City, and all of greater Ohio.